As Shadowhunters sets its course for season 2, the show’s big focus will heavily center around Jace’s going off with Valentine and how his absence affects those closest to him. It’s such a big focus that Dominic Sherwood and the cast were sworn to secrecy regarding it. But as Jace has gone off to join Valentine it’s safe to say that those he was close to aren’t taking it well, especially his parabatai Alec. “Because part of himself is missing,” Sherwood added. As we’ve seen in the first trailer for season two, Alec is vehemently defending his parabatai — his brother’s honor even when it seems like everyone else has given up hope. And that’s not something that Alec is handling well. “He can’t rationalize situations because of the lack of that bond,” Sherwood said. Watch the full interview below where Sherwood and Daddario discuss Malec’s evolution in season 2, the honest dynamic between Jace and Alec, and more. 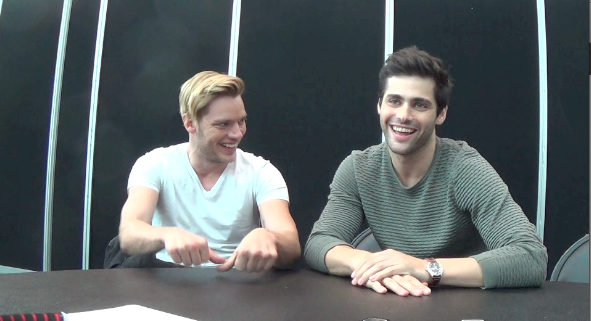 Stay tuned for more interviews from the Shadowhunters press room at NYCC!